Americans support the idea of energy efficiency, but this enthusiasm doesn’t always translate into policy solutions. How can communicators illustrate that energy efficiency is an urgent need? How can organizations move individuals from interest to action? 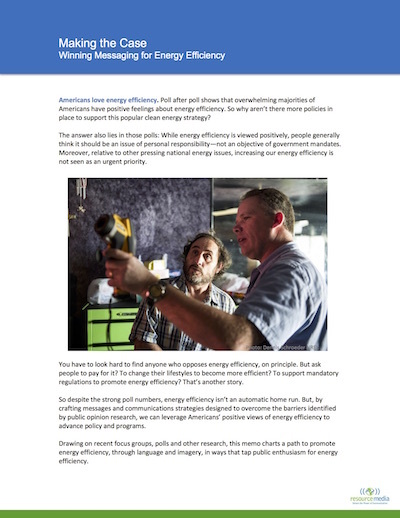 Resource Media’s messaging guide offers recommendations for crafting messages that leverage Americans’ positive opinions of energy efficiency and build increased support for effective policies and programs. Americans largely understand the concept of energy efficiency and feel positive toward it. There is bi-partisan support for energy efficiency and it is less politically polarized than other energy issues. Americans view energy efficiency in terms of personal responsibility and thrift, which leads to individual behavior changes rather than support for regulations. Climate change is not a motivating factor for supporting energy efficiency.